Happy TS day everyone! Hope you had a great weekend and are ready to start your week with the newest page of Team Stryker! Today’s page was designed for one thing and one thing only: showing off Casanova’s glorious behind! The idea of him wearing a loin cloth that only covers the front was too good of an opportunity for to pass up. I truly hope that no one is blinded by its magnificence. The other reason for this page’s existence is to give TS a destination instead of mindlessly wondering the jungle. 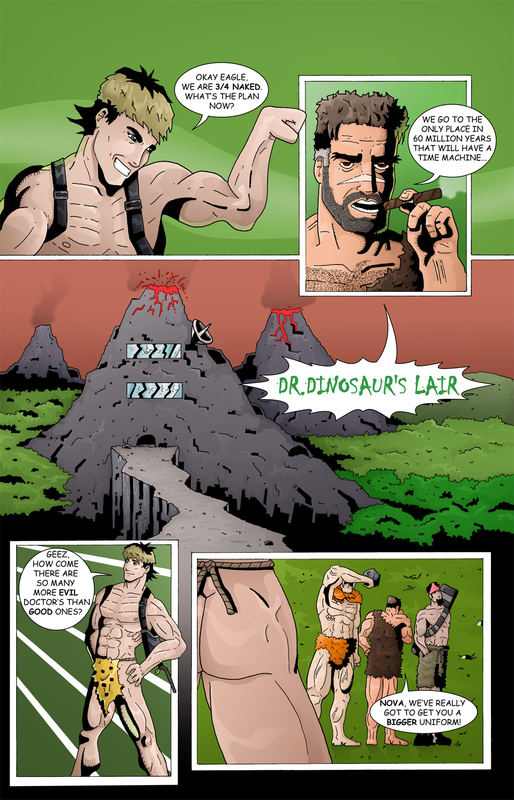 I’m sure you are all curious who Dr. Dinosaur is and how Team Stryker knows such a creature so keep checking back every Monday and Wednesday to find out! Have a great Monday and I’ll see you back here on Thursday for some more cave man action Team Stryker style!